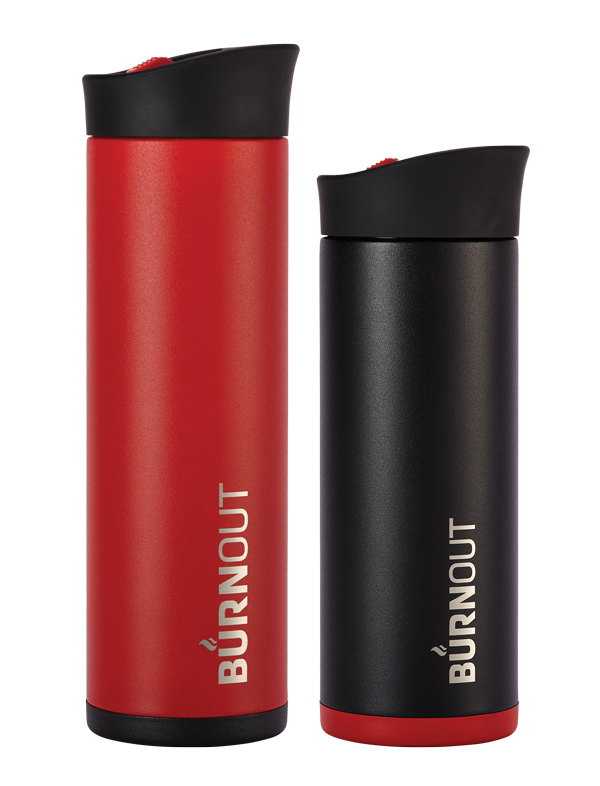 BURNOUT brings your coffee to a drinkable temperature in minutes, keeps it there for hours! 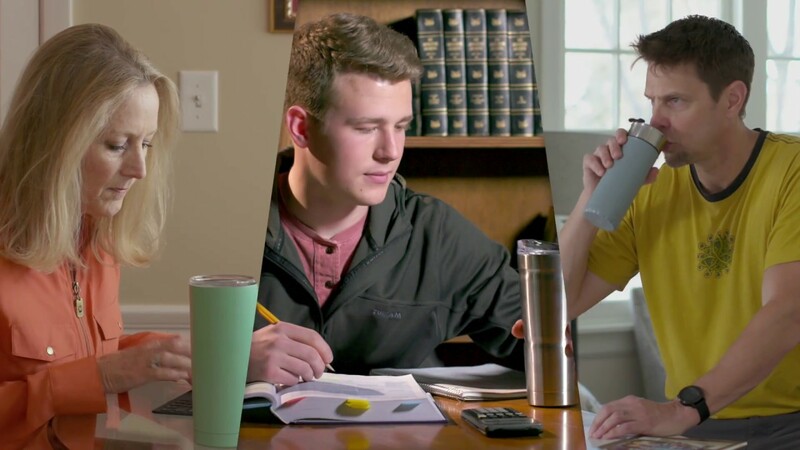 Popular vacuum mugs keep your coffee hot. Really hot. In fact, they keep your coffee so hot you have to wait for them to cool down. Who wants to wait? 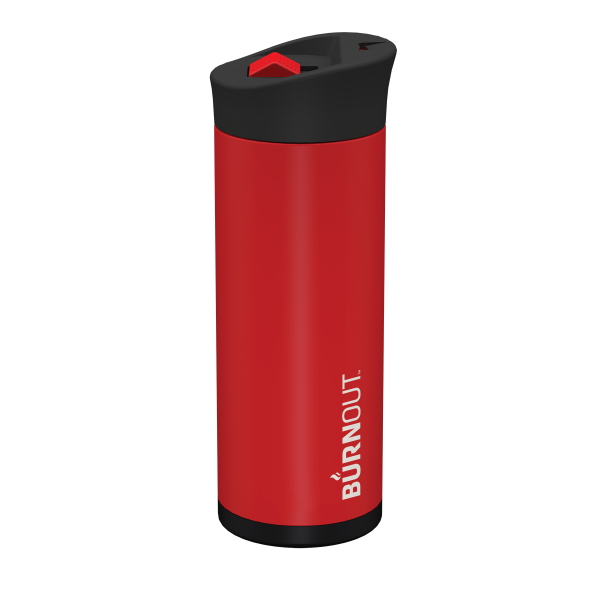 BURNOUT was developed by a group of aerospace thermal engineers who were tired of burning their mouths on scalding coffee. 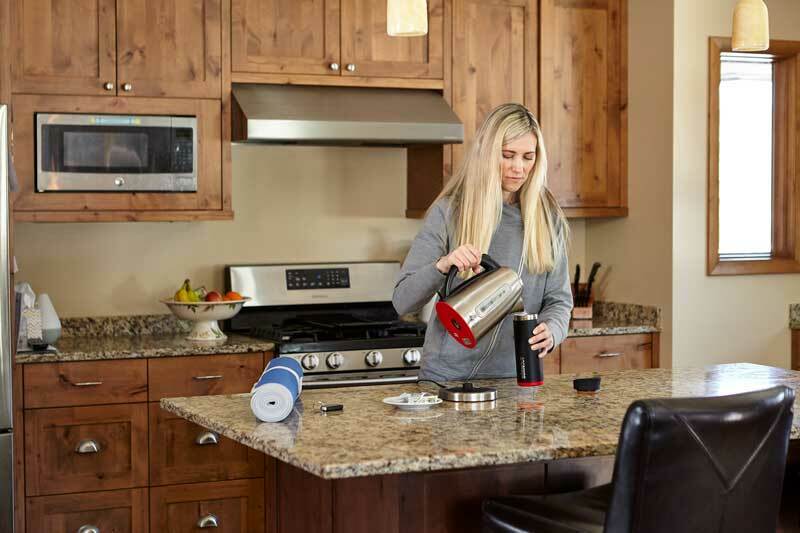 Popular vacuum mugs keep your coffee hot. So hot that you either burn your mouth or end up waiting forever for the coffee to cool. 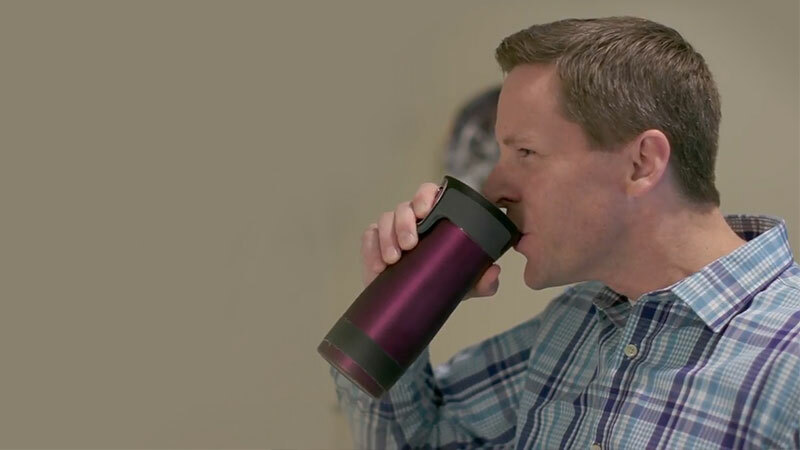 Revolutionary BURNOUT mug applies rocket science to make hot coffee drinkable right away; maintains perfect temperature for hours. 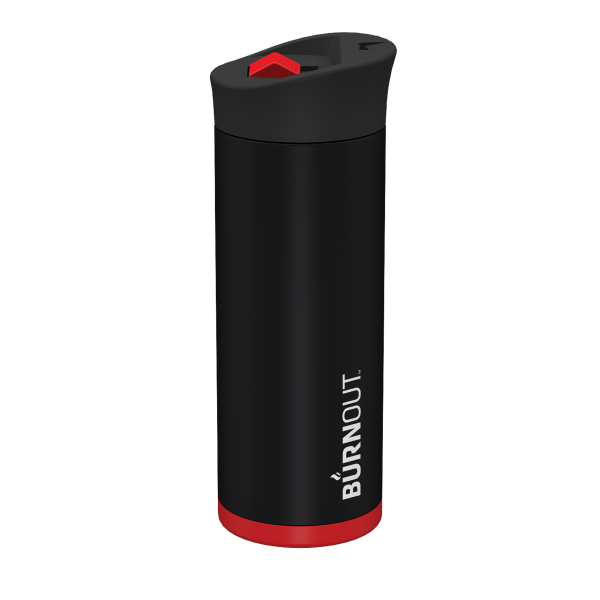 BURNOUT’s Drink Now Technology™ quickly transfers and stores the heat from the coffee, allowing you to drink your coffee almost immediately, without waiting. Then, it uses this stored heat to keep your coffee at that optimal drinking temperature for hours! 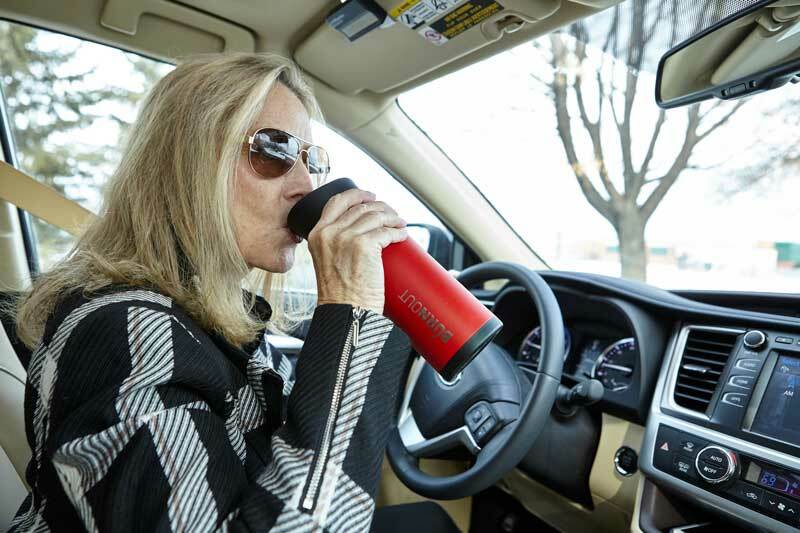 Contrast this to a vacuum mug that keeps the coffee at an undrinkable temperature for too long, forcing you to do the proverbial lip dance—continually checking the temperature and continually burning your mouth until the coffee has cooled enough to drink. Then the coffee continues to cool, meaning you’ll likely end up drinking some of it lukewarm or be forced to reheat it. What a pain! 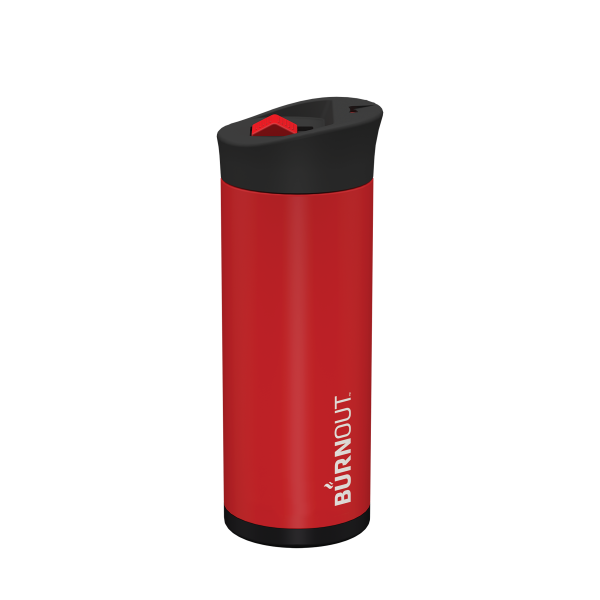 With BURNOUT, your coffee is brought to optimal drinking temperature inside of just minutes, so you won’t need to test it. And, because BURNOUT keeps the coffee temperature consistently in the drinkability zone for several hours, you’ll never be forced to drink it lukewarm or reheat it. 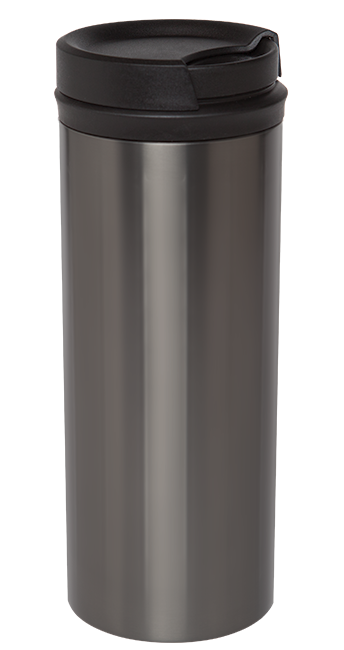 Vacuum mugs have a single vacuum chamber: two stainless-steel walls between which is a vacuum. Vacuums are devoid of matter, meaning there is nothing to transfer heat. That’s how they keep your coffee hot. The only place to lose heat is through the lid. 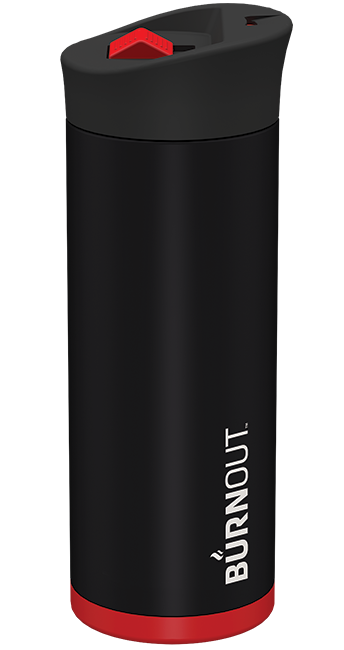 BURNOUT features Dual Chamber Design, two chambers configured from three layers of 18/8 stainless steel. 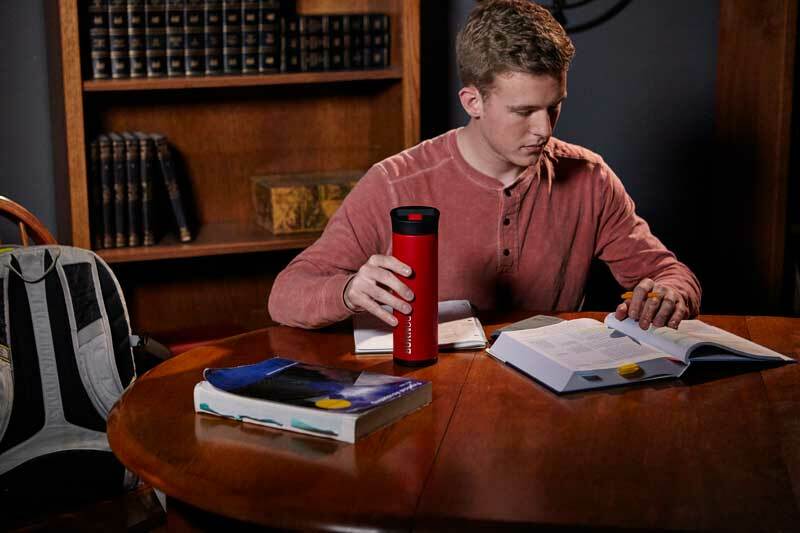 The first is an aerospace-grade vacuum chamber to the outside of the mug, while the second chamber resides to the inside of the mug and is filled with HeatZorb™, a special wax-like, bio-based substance that quickly absorbs and stores the heat from the coffee, bringing it to optimal drinking temperature (approximately 140°F) in just minutes. HeatZorb™ is technically referred to as a “phase change material” (PCM), meaning it is calibrated to change from a solid waxy substance to a liquid at a designated temperature (140°F). It is at this temperature that heat absorption stops and your coffee enjoyment begins. And because the HeatZorb™ chamber is surrounded by a vacuum chamber on one side, and coffee on the other, and the material has stored a lot of thermal energy, the transfer of this heat back to the coffee, to keep it at a zone of perfect drinking temperature. 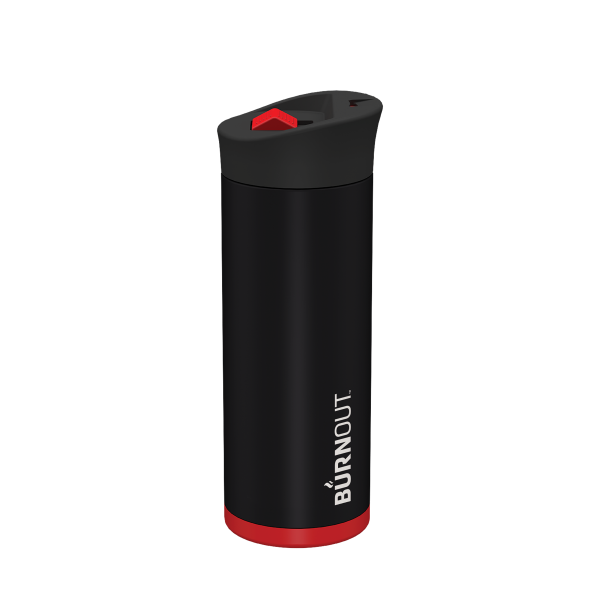 So, no burned mouth, coffee that you can drink right away and coffee that stays at that optimal drinking temperature for many hours! 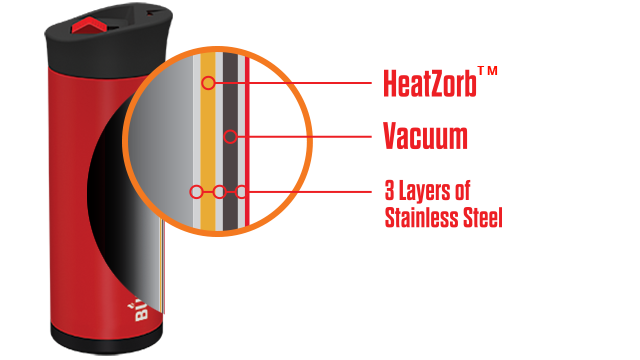 Remarkably, HeatZorb™ is produced from agricultural sources and is USDA-certified bio-based. It is non-petroleum, non-toxic, readily biodegradable and 100% renewable. Because it is captive inside the stainless-steel chamber, it can never leak. And, it will consistently perform its repeatable melt/solidify heat transfer cycles many thousands of times, essentially for the life of the mug. Don't believe us? Read reviews from our satisfied customers. I LOVE my coffee in the morning! But I HATE, HATE, HATE to burn my mouth. Maybe my mouth is more sensitive than others. But Burnout changed all of that. I have a long commute and now get to enjoy hot, but not too hot coffee the entire way. GREAT PRODUCT! I like to sip on my coffee all morning long but, before Burnout, I had to just accept that it was just going to be lukewarm. Now I get to enjoy hot coffee with every sip. Thanks Burnout! My kids bought me a (brand X) coffee mug as a gift. It sure kept the coffee hot but I didn't like burning my lips every morning. So, I would open the lid and drop in a couple ice cubes. This solved the problem but I had to drink my coffee pretty fast before it got cold. When I heard about Burnout I told my kids about it, knowing they would get me one. They did! And wow, does it work great! No more burned lips and hot coffee all the way to the bottom. I recently picked up my buddy to go on a fishing trip. 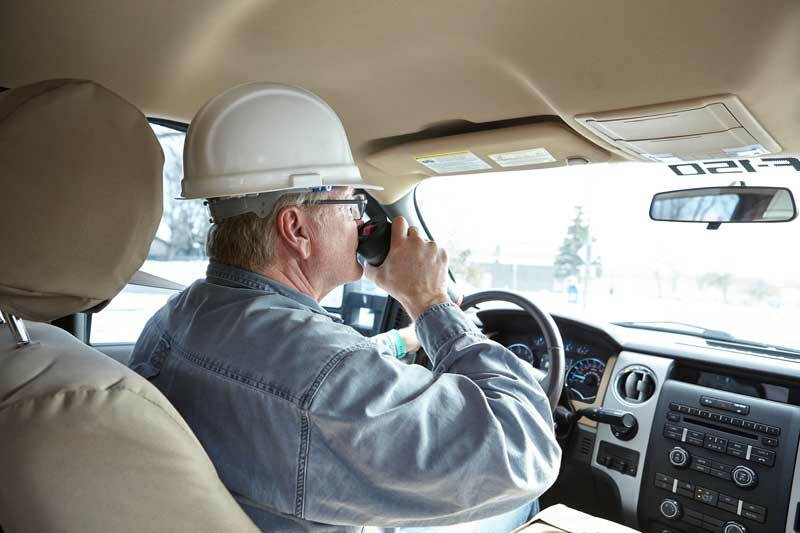 We were halfway to the lake before I could even start drinking my hot coffee while he was drinking his from the start. I asked him how he could do it and he explained to me how his Burnout coffee mug works. Now I have one the the rocket science mugs and I love it! I love my Burnout coffee mug because I always have hot coffee. But I also like that the mug fits my hand much better than my (brand X) coffee mug which is quite the handful. Shame on you, Burnout. I had almost weened my wife off of her daily coffee habit by making light of her constantly burning her tongue and re-heating her coffee. Then her sister buys her a Burnout mug. Now, she's a happy coffee drinker.